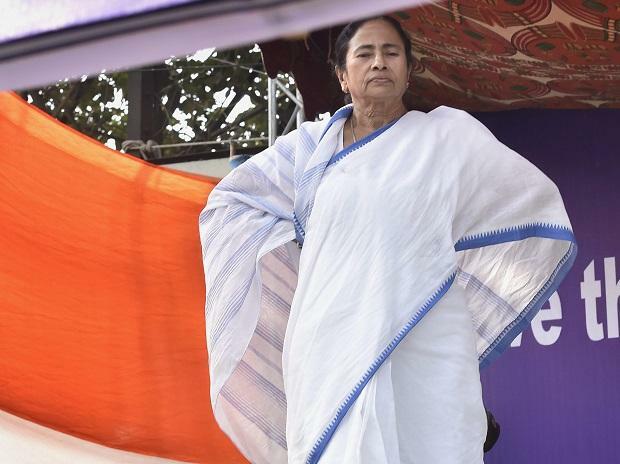 West Bengal Chief Minister Mamata Banerjee during a sit-in over the CBI's attempt to question the Kolkata Police commissioner in connection with chit fund scams, in Kolkata, Monday, Feb. 04, 2019. The Supreme Court Tuesday directed Kolkata Police Commissioner Rajeev Kumar to make himself available before the CBI and "faithfully" cooperate with the agency in the investigation of cases arising out of the Saradha chit fund scam probe. The apex court also said no coercive steps, including the arrest of the Kolkata Police chief, will take place during the course of the investigation. A bench headed by Chief Justice of India (CJI) Ranjan Gogoi also issued a notice to Kumar and sought his response before February 20, the next date of hearing on the allegations by the CBI that he was tampering with electronic evidence and that the SIT headed by him provided the agency with doctored materials. The court directed Kumar to make himself available before the CBI and "faithfully cooperate" in the Saradha scam probe. The apex court also directed the West Bengal chief secretary, the director general of police (DGP) and the Kolkata Police commissioner to file replies on the contempt pleas filed against them by the CBI on or before February 18. The bench also comprising justices Deepak Gupta and Sanjeev Khanna said on consideration of replies of the chief secretary, the DGP and the Kolkata police commissioner, the court might prefer the personal appearance of these three authorities on February 20. The bench said the apex court's secretary general will inform them on February 19 whether they are required to be present before the apex court on February 20.